Facebook is a great way to connect with friends, both old and new, and to see what is happening in the lives of others. You can stay in touch with distant relatives, old friends, and former classmates. However, despite Facebook’s benefits, it’s all too easy to fall into the traps of this social networking site. Facebook is a place for everyone, especially young people, to express their individuality and uniqueness in a safe environment. It is important, though, for every user to represent themselves authentically. Teenagers, and all users, should say and act as they would in real life. It is easy to get wrapped up in the anonymity and distance of the Internet. A simple rule to follow is to not post anything that you would not want your parents to see. As a teen on Facebook, be sure to only accept friend requests of people you know. It’s also important that you never share your password with anyone. It may not seem like it, but friends come and go when you’re a teenager, and the people you trusted with your password yesterday could make it their mission to ruin your online reputation tomorrow. It’s therefore best to keep your private information… well, private. Below are some more tips for keeping social networking a positive experience. It’s okay to block bullies. Finally, always tell an adult you trust about the messages, as well, because if the person continues to bully you, you may need this adult to step in. Don’t let anonymity change you. The internet has a strange way of changing people’s personalities. People that are normally kind and respectful can change into ruthless and arrogant posters as soon as they sit behind a computer. This is mostly because the internet creates a distance between people, making the impact of bullying less immediately obvious. However, it’s important to resist the urge to bully others while hiding behind your computer. When posting, ask yourself first if the post will hurt someone or if it could eventually come back to haunt you. Your friends, classmates, and teachers may hear about it later, so be sure you feel confident in your post. Anything you post can be copied or shared with others, so avoid having to apologize to others by taking the time to think before you post. Make time for real life, too. Although it sounds silly, recent research has revealed that many Americans are addicted to Facebook. The social networking site helps people procrastinate on an assignments, chores, and homework, and excess Facebook use can also lead to depression, stress, and anxiety. A recent study from the American Academy of Pediatrics shows that the more time an adolescent spends on social media, the more likely they are to develop symptoms of depression. Since Facebook gives a skewed view of the way things are, teens who rely on the site to give them their view of the world will come away with a very warped impression of the way the world works. 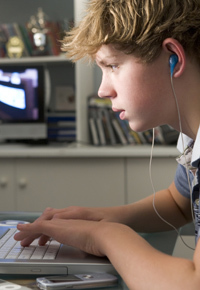 Facebook can also become a huge waste of time, which can prevent teens from developing hobbies. Also, if you spend all of your time online, how will you ever make friends in real life? Avoid letting Facebook take over your life, and limit the amount of time you spend on the site. Surviving the teenage years can be extremely difficult, and if things have gotten out of control, there’s no shame in admitting that you need the help of an expert. The qualified staff at a Christian boarding school is an excellent resource for helping you and your family through the trying teenage years. Specializing in treating troubled and at-risk teens, these schools approach education with a balance of discipline and love, and their methods have helped countless teens transform into intellectually, emotionally, and spiritually healthy young adults.